Founded in Calgary, Alberta in 1993, DWA Interior Furnishings has been providing interior designers, architects, workrooms and the trade with the finest in interior furnishings for over 15 years. Products available through DWA can be found in public buildings, corporate offices, major hotels and resorts, as well as many finely appointed residences. As the representative of respected design houses and suppliers from around the world, DWA delivers unparalleled quality and service with the market knowledge that only a locally owned and operated company can provide. DWA is dedicated to serving the design community throughout Alberta, Saskatchewan and Manitoba. 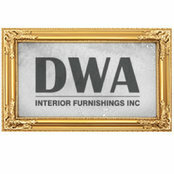 DWA is very accomodating and helpful in any kind of search for fabrics as well as keeping us up to date with new products. I would never hesitate to recommend them.